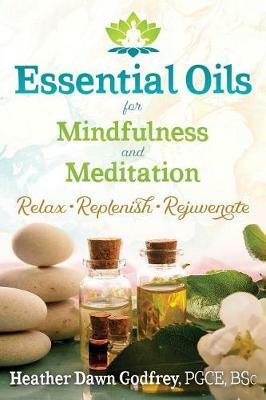 A hands-on guide showing how essential oils can support and enhance meditative and mindful practices. For millennia, the spiritual power of odor--such as from incense or frankincense--has been used to symbolize intention, stimulate awareness of our spiritual self, and accentuate rite and ritual. Drawing on this power, as well as their healing qualities, essential oils can provide the perfect complement to meditation or mindfulness practice. Outlining the practice and benefits of meditation and mindfulness in combination with the use of essential oils, Heather Dawn Godfrey explains how these practices hone and sustain a conscious awareness of "being" in the present moment, focusing attention on what you are sensually experiencing and leaving no space for regrets, traumas, fears, anxiety, or anticipation. Providing the latest scientific research on the restorative, rehabilitative, and psycho-emotional healing effects of essential oils, she explains how the sensory experience of odors can immediately draw your attention to the present moment, trigger a specific state of consciousness, such as a deeper meditative state, or offer a way to regain composure quickly when dealing with life's ups and downs. Explaining methods to incorporate essential oils into your practice, Godfrey introduces readers to the "Gem" essential oils--a group of oils specifically selected for attaining and maintaining a state of mindfulness, as well as a broad spectrum of therapeutic properties--and she provides an easy-to-follow chart to help you select the oil that is right for you. Offering a hands-on practical guide to integrating essential oils into mindful and meditative practice, the author shows how each of us has the ability to self-generate a calm, tranquil, and worry-free state of mind. "There is a unique way to enhance psychological well-being waiting to be explored. This book tells you how meditation and aromatherapy, classic tools for modifying the mind, can work together to maintain a state of calm and insight. Familiar oils like rose and frankincense add serenity and inspiration to the practice of mindfulness meditation. Diffusing an essential oil during meditation practice can even return your awareness to that meditative mode if you smell the aromatic oil again later. The author is an aromatherapist who not only uses essential oils professionally but also conducts research into the effects of these powerful plant ingredients. The reader will find out how knowledge of traditional practice and subjective experience, backed by scientific evidence, is an ideal path for discovery; how mindfulness meditation and essential oil inhalation relieve anxiety or calm the mind, as explained from the perspectives of ancient history, religious practices, and modern complementary medical practice. Scientific studies involving human subjects and essential oils tested in laboratory models are described in easy-to-digest detail that adds value and validity.